my coworker was going through a box that had been sitting in a shared space for quite some time. by quite some time, i mean there are documents in there from as early as 1951. (see above). i will transcribe it for you because it’s been sitting in a box for far too long and it’s about dang time this charming carbon copy saw the light of day. Early today I learned that as of this date I will be denied the daily privilege and pleasure of working with you. This knowledge makes me feel as though I had been fired from a job that I liked very much — and I’ve had mighty little notice too. Your retirement will make my work at this Press less interesting, for I shall sincerely miss our friendly business relations. May your ample store of good humor and wit help you hurdle the problems of retirement as they did the problems of business. And may you enjoy a long, happy, and healthy retirement. isn’t it exactly the type of letter you hope to receive one day? i sure hope to. and, come to think of it, it’s the type of letter i wish i’d had in my possession a couple of months ago when my beloved boss retired. i definitely and whole-heartedly would have given it to him. and now, just now, i’ve re-adjusted my life’s plan. 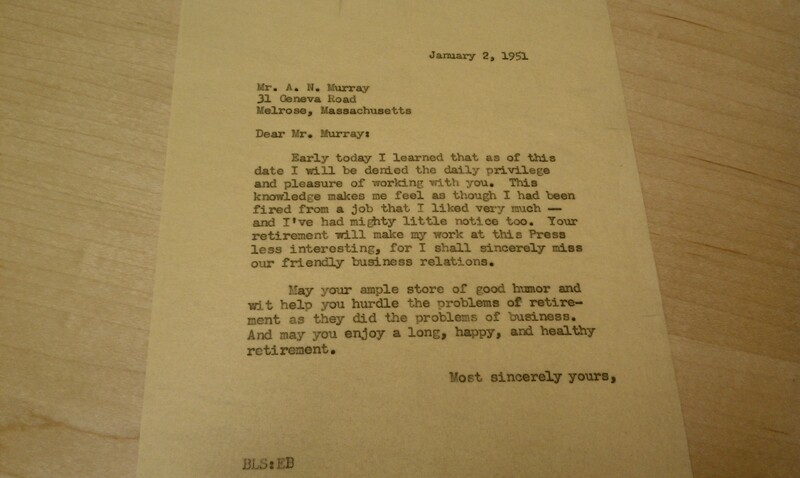 i want to receive a letter like this some day when i’m old and gray or, you know, tomorrow would work just as well. may you all find something noteworthy today. go forth and search. and then report back. This entry was posted on September 16, 2011 at 8:00 am and is filed under general. You can follow any responses to this entry through the RSS 2.0 feed. You can leave a response, or trackback from your own site. people were so charming back then. what happened? it should be our mission to bring the charming back. oh, i didn’t mean it like i was wishing my life away, but rather wishing to make such a positive impact on someone that they felt compelled to write something so complimentary and awesome about me. but yes, you do have a point, i shouldn’t wish life away and in fact, it’s a good reminder to take a deep breath and look around at this moment i’m in. it’s a good one. I just found something noteworthy: the comment from your Grandpa above. “Don’t wish life to go fast.” Wow. No, I mean WOW. That right there is making me think I need to readjust my outlook on life… Thanks, Abby’s Grandpa! let me just find my typewriter………. you mumfys are wise ones. and you pebbsie never stop shocking me with your commenter names. What I find most charming isn’t the style but the fact that people took the time to write at all. To each other that is. When I was growing up my Gram encouraged me to always write Thank you cards. She said that was the difference to being grateful or entitled. At a young age, I was given personal stationary and a special pen to write my messages filled with words of thanks and gratitude only my hostess would understand. This tradition has stood the test of time and to this day I still send Thank you cards. It is one life lesson that I am glad I learned. ME TOO! ME TOO! my mom instilled the writing of the thank you notes tradition and to this day, i still send them for all occasions. i actually love writing them because, yes, it gives me one more opportunity to be grateful for both the gift and the gift giver.